1) I will never take a bus or cab, because that’s not a “true” pilgrimage. 2) I will carry all of my stuff the entire way and never use one of the bag transfer services. The Camino should be challenging. 3) I will follow my preset schedule carefully so that I can see everything. I too had rules like this when I started my first Camino. Then I hurt my knee so badly I had to go home after one week. Sigh. Here the guidelines I’ve been living by on my second Camino. I started in Saint Jean Pied de Port 35 days ago and I will arrive in Santiago tomorrow! 1) I will end this walk in better shape than I started it — physically, emotionally and spiritually. This doesn’t mean that I avoid all pain or discomfort. Cause there has been a WHOLE bunch of that. But I keep checking to see if my actions are helping me grow or hurting me. It’s hard for me to tell which is which sometimes, so all that is part of the learning process. Physically, I erred in the side of caution a lot at the beginning, due to my injury on my first Camino. But now I’ve walked hours and hours a day with all different sorts of pain. And I haven’t broken yet. I just keep getting faster and stronger. But it took me weeks to work up to that. How I felt the first few weeks of the Camino. 2) I will spend time with people I enjoy and who inspire me to be a better person. And I will be as generous and kind to that community as possible. This includes striving to be a great listener and fantastic question asking. Sharing food and treats. Watching fellow pilgrims’ children. 3) I will walk as much of the Camino as possible. I will carry my own bag as much as possible. On this second Camino, I did not walk the whole way. I took a bus three times and a cab once. All were for fairly short distances to fix very big problems. I also used a bag transfer service for the first three days, when I was feeling really horrible… and almost didn’t start. If you own the popular Brierley guide, he has a good discussion about this. He recommends taking the bus in and out of Leon as it’s dangerous highway waking. And he encourages you to do some self-reflection if you judge other people for doing this. 4) I will stop and try to go inside every church. This isn’t a religious thing for me. But since it’s a Catholic pilgrimage, it’s a really fascinating way to explore a country’s history, culture and art. And more importantly, it makes me slow down! I take my bag off. I chat with people. I read some pamphlets. Sometimes I sit for a long time and meditate. Sometimes I go to Mass. In a very cool old church in Rabanal. You can stay and rest at this monestary as long as you stay for at least 2 nights. This one has been REALLY hard, as I have felt overwhelmed with the crowds at the end. And sometimes I wish all these new people would go away! But everyone has the same right to be here as I do. And I have no idea what anyone else’s story is. Walking farther doesn’t necessarily mean it was harder for you. And harder does not necessarily mean you got more out of it. So it’s best if I just mind my own business. What guided your decisions on the Camino? It took me 2 years to complete my first Camino. IN 2016 I started from SJPP but had to stop in San Juan de Ortego for injuries and to return to a post-grad. 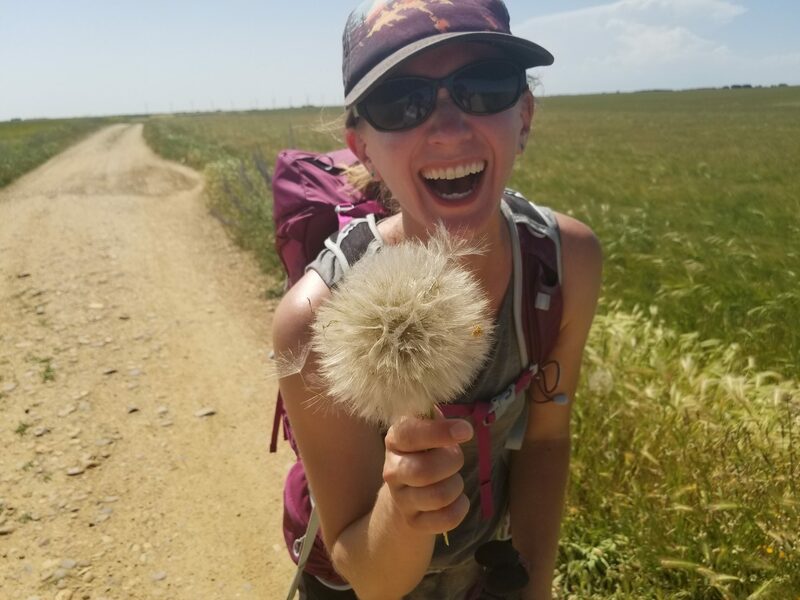 I just completed my first camino on July 2nd where i picked up where I left off. Although, i had always wanted to finish in 2016, I am so glad i did it in stages. I met additional friends and had different experiences. It was difficult but I luckily did not have to take a bus and did carry my backpack the entire way. The last 100 klm was also crowded but there were even a few people i met whom started in Sarria which were encouraging to me even when I was limping along, and I also encouraged them as they were just adjusting to the path. Your photos sparked several emotions I was having during walking at those specific points. Forever, I will be a pilgrim! thanks for sharing. What is the name of that lovely church? Iglesia de Santa Maria de la Asunción?? I want to stay there when we go through. The church is in Rabanal. It’s two towns before the Crux de Ferro. There is a donativo albergue next door. The monestary is attached to this church, which offers an extended stay with them. I don’t remember the names, but it’s a very small town. You cannot miss it.